A little like those seven hapless travelers whose fabled “three hour tour” ended up turning into three years on “Gilligan’s Island,” the voyagers on this trip probably never saw it coming either. To be sure, when they left Caesarea and then Sidon, the winds had prevented them from taking the direct route over to Asia Minor (what we call Turkey today), and so they had been forced to pass on the leeward side of Cyprus, that is, the side that was downwind, which took several days longer than they had expected. And then from Cnidus down to the island of Crete, they had once again had to take the leeward side, causing in the words of Dr. Luke who was on that journey with Paul, “much time” to be lost, Acts 27.9. So much, in fact, that it was dangerous just to be out on the waters at all, much less try to cross the Aegean Sea. For sailing after September 15 was doubtful and after November it was downright suicidal. Only, as good old Luke the historian is quick to point out, since it was already after the Jewish Day of Atonement, that meant that it was at least October when they set out. So they probably knew that there was no way to make it all the way to Rome, but they reasoned that if they could only get to Phoenix, a little further to the west on the island of Crete from Fair Havens that it would at least be a much better place to spend the winter. The little band thus set sail and when a gentle south wind began to blow, it might have seemed like, in spite of Paul’s prophecies of doom and gloom, that it was all going to work out. Until, that is, the kind of storm that they called simply a “Northeaster” hit them and, caught up in near hurricane force winds, that prison transport ship from Alexandria could do very little but simply be driven along by the wild gusts and gales. The storm was so intense, in fact, that those onboard were barely able to hoist up the lifeboat and secure it. Only no sooner was that task accomplished but that the ship itself began to literally be torn apart. So they tied it together by passing cables and ropes under the ship– which meant that some poor sailor had to go down there — and when that wasn’t enough, they began to throw all of the cargo overboard to lessen the load. And when that wasn’t enough either, they then began to throw out even the essential spare parts– the extra masts and tackles that every ship would carry on a voyage in those seas. Only still there was no sign of relief. For eleven days and nights the storm continued to pound them, making it impossible to see the sun in the day, or the stars at night, or even to be able to tell the difference between the two. The ship was leaking badly and there was little food left, but even what had not been destroyed or washed away went largely untouched, for as tired and weak as they all were–passengers and crew alike–who could have had an appetite to eat in such an impossible situation? And so we can understand it all how they must have felt when Luke tells us in the astonishingly poignant words of verse twenty that “when neither sun nor stars had appeared for many days and the storm continued raging, we finally gave up all hope of being saved.” For like that unexpected Northeaster on the Aegean Sea, Hurricane Harvey has come upon us suddenly and with little warning, as well, and it shows no signs at present on moving on in any kind of timely way. Only read on just a few more verses of this rather gripping travel narrative in Acts and you will see that it wasn’t the end of the story. What’s more, when the storms of life are raging all around us as well such is not a time for us to give up hope either–it is not the moment for grumbling or dissent– it’s not the season for worry or impatience or anger–rather, it is a kairos or timely occasion for discipline and for courage. “Consider it pure joy, my brethren,” wrote James, “whenever you face trials of many kinds.” “Endure hardship as discipline,” added the writer to the Hebrews. And don’t you love it that even the apostle Paul, that seasoned and serious saint whose labors summoned and supported the early church of Christ, could not resist saying “I told you so” at least a little when despite his warnings the ship had sailed on for Phoenix, only to be smacked down by a storm that seemed to go on forever. “Men,” he says, “you should have taken my advice…then you would have spared yourself this damage and loss.” For Paul knew that sometimes the real storms in life aren’t those that come from the outside, they are the ones that churn up on the inside of us. Victor Hugo tells in his last novel called “Ninety-Three” of another such ship that was once caught in a dangerous storm on the high seas. At the height of the storm, however, the frightened sailors heard a terrible crashing noise below the deck. And the reason it was so terrible is that they knew what it was, for the noise was coming from a cannon, part of the ship’s cargo, that had broken loose. It was moving back and forth with the swaying of the ship, crashing into the side of the ship with terrible impact. Knowing that it could cause the ship to sink, two brave sailors volunteered to make the dangerous attempt to retie the loose cannon. Because they understood that the danger of a shipwreck from the cannon was greater than the fury of the storm. And that is like human life, isn’t it? The storms of life may blow about us, but sometimes it is not those exterior storms that pose the gravest danger. It is the terrible corruption that can exist within us which can overwhelm us. Because the furious storm outside may be overwhelming but it’s what is going on inside that poses the greater threat to our lives. So that’s when discipline is needed. That’s when we simply need to fall back on what we know is right and follow the principles of our faith that have been proven to be timeless and trustworthy. When the unexpected gales of life are blowing, then in the words of the former Prime Minister of England, Margaret Thatcher, the Iron Lady, “it’s no time to go wobbly.” Or as the popular slogan of England went during the dark days of the Second World War, “Keep Calm and Carry On.” Because when the storms come, it’s also a time for courage. And that’s the best thing about this little story here in Acts 27. 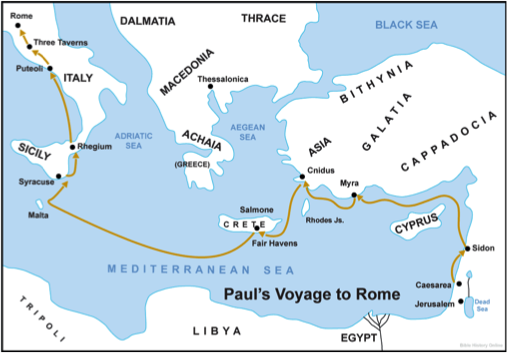 For you see, St. Paul didn’t just remind his fellow voyagers that he had warned them about setting out on that journey, but he also went on to give his companions a message of encouragement and hope, as well. “I urge you to keep up your courage,” Paul said, “because not one of you will be lost.” The ship may be destroyed. We will run aground on an island. But not one of you will lose even a single hair from your head. And what a wonderful exhortation that should be for all of us, as well. For even when the winds of strife may be their strongest, and we can’t even begin to see the end of it all, that’s when we need to take courage and be confidant in the promises of God, trusting that God is still in control, no matter what the circumstances around us might suggest.